Because I am scouting for new awesome locations in Berlin all the time, I do have a lot of coffee dates. I am not complaining, I love it, but sometimes I want to do something else. Berlin offers a lot of do-it-yourself workshops, which I found really refreshing: From brushing, taking photos to planting, I tried it all. I would also highly recommend the workshops for your unique birthday party or as a gift. To put it in a nutshell, here are my Top 5 workshops in Berlin. Learn to shoot wonderful portraits with your smartphone - with ease, comfort and attention. Goodfeelography is a photo smartphone workshop in Sylvie's photo studio in Berlin-Mitte, where you learn to feel comfortable in front of and behind the camera. This is how great portraits are created. She will teach you basic knowledge in camera and lighting technology, image composition, posing, facial expressions and body language. Here you will take photos of each other in front of different colors and lights (its a very colorful studio! 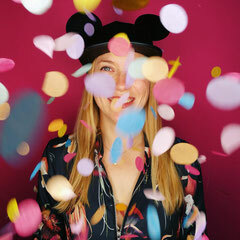 ), with masks and outfits, props and lots of confetti. Feels a little bit like love parade! Absolutely recommendable. Brush lettering is Jen's true passion. 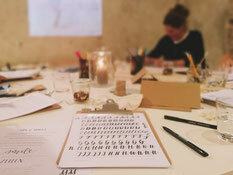 In this workshop she will teach you, how to construct the individual letters yourself. Each birthday post card will – after this workshop – be carefully brushed by hand and designed with the concept of bringing good energy onto paper. The art of lettering (it feels a little bit like painting) felt like a true meditation for me. 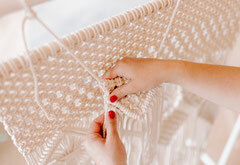 Thanks to Jen's Dhavi Design Guide Book, you can further develop your skills at home. At an ArtNight you create your own artwork. It is know for painting workshops (I actually attend their first ever given workshop in Berlin), but they also host Makramee workshops. The artist of the workshop will show you, how to do the Makramee. Even did manage and I always say, if I can do this, everyone else will be able to succeed. Just get creative, get to know new people and end up going home not only with your own artwork, but also with a good mood and great memories! At Plant Circle you will learn how NOT to kill your plants: where to place them, how to water the correctly and more great tips on how to keep them alive and thriving for the years to come. 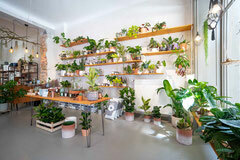 Participants will receive plants or cuttings at the end of the class. Dubenkropp Pralinen & Schokoladen is a chocolate shop with a glassy chocolate atelier, where you can buy very delicate handmade truffles, enjoy a tasty hot chocolate or cappuccino in a warm atmosphere or take a class. You learn about milk chocolate, dark chocolate and what is important to look at when you buy chocolate. 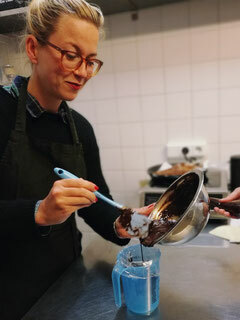 Sabine also reveals here recipes how to make pralines which my friends and I did enjoy the whole week, as you can take them with you!